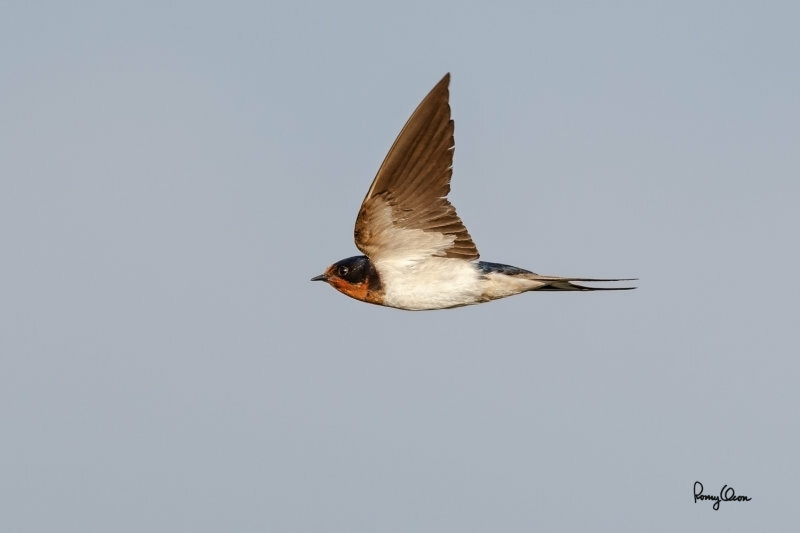 From the tip of its short bill, to its small dark head and sleek body, to the forked tail - it seems evolution has designed this bird to be fast and extremely maneuverable in the air. It's a very common migrant, and I often see it hawking small insects while flying low. But its speed and unpredictable flight pattern make it a very tough customer to acquire and focus on, plus its contrasting plumage is an exposure challenge. Light quality and intensity have to be just right so the dark head can be illuminated well, while avoiding blowing out the white body. The plain sky background makes it easier to catch the bird in the viewfinder and to place it in precise focus. 400 mm, f/5.0, 1/2000 sec, ISO 320, manual exposure in available light, hand held, major crop resized to 800 x 533.